is sitting in her room, and what ever she thinks about appears. named things and as she named them they appeared. Native stories don't end after two hours in a theatre, or when we turn off the electronic box. Like the Hands of Spider Woman, they keep spinning and evolving, generation into generation, from the waking world to the dreamtime. Storytelling, in native traditions, is more than a way to pass on history and religious beliefs to the next generation - it is also a ceremony that acts as a link between the mythical beings and the people themselves, whose ritual life is based on the mythic cycles. This is the same way sacred masks, throughout the world, are regarded and used - as doorways into the realms of the deities. the Navajo. The Pueblo Indians refers to many native peoples living there, from northern New Mexico to the Hopi mesas of Arizona, with many unique cultural differences. These people are believed to be the descendants of the vanished Anasazi who built cities, cliff dwellings, and ceremonial centers throughout the area. In Pueblo mythology Thought Woman, Sun Father, and Corn Mother are the most important deities. These primal deities are each powerful, but they are also interdependent. Thought Woman/Spider Woman is the creatrix of the universe, which she sometimes initiates alone, and sometimes in partnership with the Sun. The creative impulse is something Thought Woman passes on, originating from the Web's center a generative process continually expanding through her daughters, sons, and a non-human pantheon of relations as well. 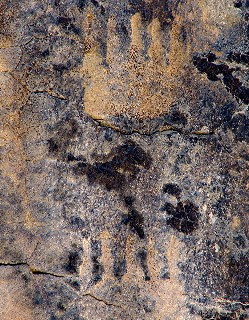 There are also tales (among the Hopi) that say Spiderwoman, with Sun Father, fashioned the very first people (which also included two-legged people) from red clay. 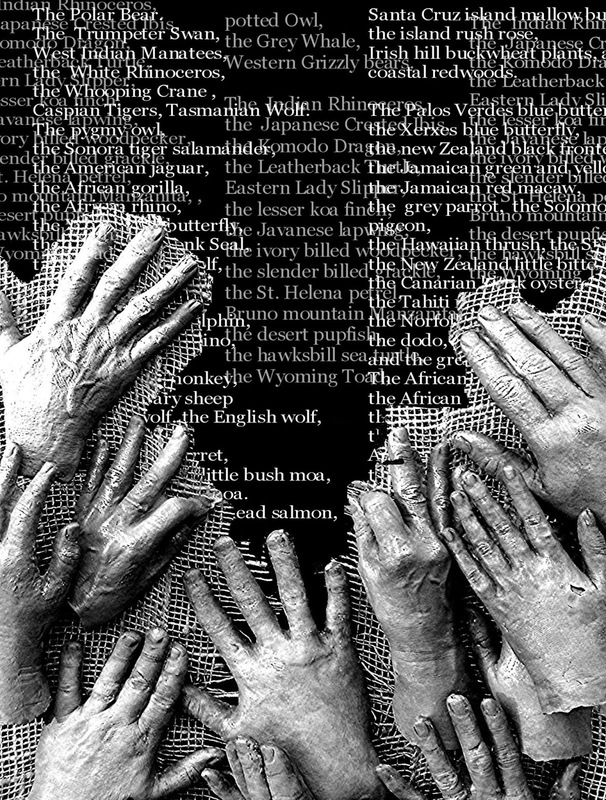 When ceramic artist Kathy Space and I began our community sculpture project in Midland, Michigan (2007), we conceived of “prayer ties” to unify a mosaic composed of casts of participants’ hands and faces. 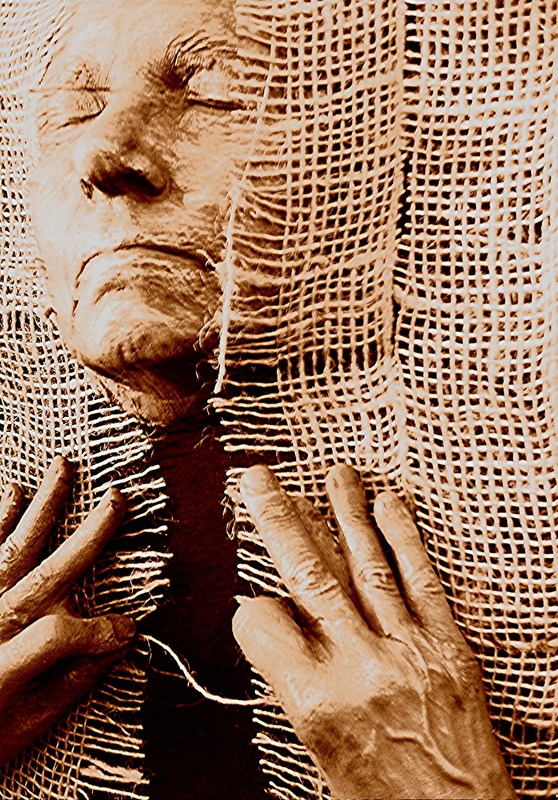 This variation on Spider Woman Web seemed like another “thread“ to envision the telling. 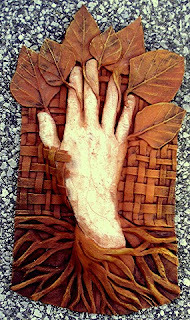 A Web of minds and hands, made of red terra cotta clay. Terra. The good red earth, the color of life, of blood, of vitality. A "Spider and Cross" symbol is found, ubiquituous, among the prehistoric Mississippian people thorughout the South and Midwest, and a Spider Woman, who is also a variation of Mother Earth, is found among the Maya. The Navajo (who call themselves the “Dine” which means “the people”) revere Grandmother Spider Woman ('Na'ashje'ii sdfzq'q) because she taught them how to weave. "The Navajo have their own version of Spider Woman. As with all metaphors, Spider Woman is a bridge that allows a certain kind of knowledge to be transmitted from the mundane to the sacred dimension.........they believe that an individual must undergo an initiation before he or she can be fully receptive to this kind of knowledge. Thus, to the eyes of the uninitiated, Spider Woman appears merely as an insect, and her words go unheard. But to the initiated whose mind has been opened the voice of this tiny creature can be heard. This is the nature of wisdom, c0nveyed through the metaphor of Spider Woman. 1"
Spider Woman (who lives, the Navajo say, on Spider Rock in Canyon de Chelly) is always available to help her descendants. She can best be heard in the wind (or on the transparent threads of synchronicities) - if one is quiet, and prepared to listen. 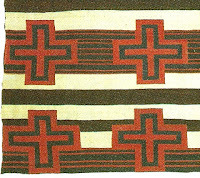 Navajo rugs often have Spiderwoman’s Cross woven into the pattern. The cross of Spider Woman, it seems to me, is another very important symbol for our time, because it represents balance - the union of the 4 directions or 4 elements. The fifth element is the unifying force, the mystery at the center. To “walk in beauty” is to be aware of a “moving point of balance” as we walk across the land, and walk through the circles of our lives and relationships. Spider Woman has a way of getting around. Although she can be found in the canyons and deserts and prairies and forests of the Americas (and stories about the Yellow Women, and “Born from the Water” and “Monster Slayer“, and Evil Katchina, and many others, are well worth the telling) - it seems her grandchildren traveled to many other places and times as well. Perhaps she was once Neith, the primal weaver of ancient Egypt. In Celtic lore she has her hand on the web of the Wyrd, and in India, there is the great Jewel Net of Indra, wherein each gem infinitely reflects every other gem. Among the Greeks she gave Theseus a thread to guide him through his labyrinth - a thread not unlike the same threads she casts to you, and to me, now and then, on our own heroes journeys. And today? Well, there are many contemporary ways Spiderwoman makes herself known. 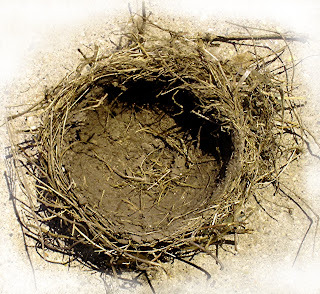 Ecologists speak of the great Web of life, while physicists speak of entanglement theory. I like to think that the Internet is Spiderwoman's latest appearance. I have the feeling She’s working very hard now to make us pay attention. and the world is woven into us. We’re weaving the world into being with the stories we tell, right now. I have found that Spiderwoman delights in all things connected, co-creative, collaborative, cooperative, communicative - all those “co” words. Warp and weft. May we all be conscious weavers, beautiful weavers. For our children, for all our relations, for the future. The Aldon B. Dow Fellowship, The Puffin Foundation, Kathy and Steve Space and Space Studio, and you - for weaving this story with me. 3 Keresan Pueblo Creation Myth - Patterson-Rudolph, Carol, "On the Trail of Spiderwoman", Ibid. 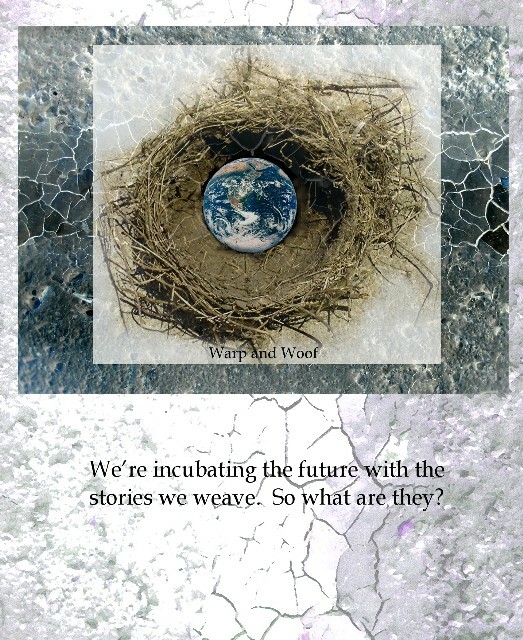 with the stories we weave. "In 1987, the last Dusky seaside sparrow disappeared from the earth. Imagine the people of Merrit Island, Florida, gathering to hold vigil on the marsh's edge each June 15, the anniversary of it's passing. Or imagine the citizens of San Francisco gathering in the spring, beneath rustling eucalyptus trees at the Presidio, to remember the Xerces blue butterfly. That was where the last one was seen, in 1941. Can you imagine the California condor, it's wings circling in the desert air? Can you hear a Mexican Grey wolf, howling in the night? Psychologists have not begun to ponder the emotional toll of the loss of our fellow life. Nor have theologians reckoned the spiritual impoverishment that extinction brings. To forget what we had is to forget what we have lost. And to forget what we have lost means never knowing what we had to begin with." Frank Barney, who owns the Brushwood Folklore Center in New York with his wife Darlene Barney, has hosted the Starwood Festival, and the Sirius Rising Festival, along with many other events, for over 25 years. I’ve spent a few summers there myself, teaching workshops, as the “artist in residence“, or just helping out in general. It’s a home for me. 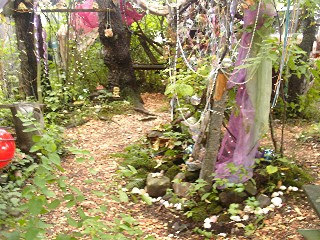 We’ve dowsed wells and places for rituals, I planted a crabapple tree there when my marriage ended to symbolize new beginnings, I made a moss garden deep in the woods as a kind of elemental shrine, and I’ve danced around the Maypole and many bonfires. Just a few days ago I walked, with some 300 people, in and out of a labyrinth made of lumeria candles in the blue, misty twilight. It was truly a "living metaphor". Frank and I also had a great conversation this past week, walking in the woods of Brushwood, and riding through the “village” that always seems to bubble magically out of the ground when the big festivals happen. I asked him what it was like to live with a particular place since childhood, to grow up within his environment of forests and meadows, as Brushwood is, and eventually become its caretaker and collaborator. Frank had been answering my question, of course, which was “how do we speak with the Earth” in his own inimitable round about way. He was doing it literally, as we toured, looking at favorite trees, feeling the geomagnetic intensities of various places, the “green breath” of the forest. “What I've been trying to do” he said, “for the past 30 years is to create a place that can facilitate communion with the Earth. By treating the land with respect, by acknowledging the presence of so many other intelligences, visible and invisible, that are evolving within the immanent cycles of life, right here, on the land. On this land, with all of its uniqueness. And there are different ways we've accomplished that. For example, because we didn't have much money, we couldn't do what many people do when they acquire a piece of land. Which is to come in with big machines that level and dominate the land, bulldoze it flat, force it to do what they want it do. We didn't have the financial means to do that, even if we wanted to, so Brushwood evolved gradually, organically, according to the dictates of the land, its contours and water ways and bumps and swamps and resources. And also its energy leys and vortices. We bring people here who have an earth friendly ethos and mythos. They can feel safe here, they can interact and create and explore without ridicule or hostility. They come here to connect, to play, or to heal. They can do ritual, make things like art or theatre or music, wear masks or costumes, dance, have discussions, make love, get naked in the sun or rain if they like, the children can ride their bikes or play in the mud - they feel safe. So the Earth can speak through them in all the things that they say and do. Where I take myself to heal. And I cannot tell myself from one lone tree. Nor makes me run away. That I take away with me. Earth cure me. Earth receive my woe. Rock strengthen me. Rock receive my weakness. Rain wash away my sadness. Sun make sweet my song. Spiderwoman is the mythic Weaver at the center of the Web of life among many Native American spiritual traditions, including the Hopi and the Navajo. We’re all Spiderwoman's grandchildren, weaving the future into the Web of life with the stories we tell, the links we name, and the works of our hands. In collaboration with artist Kathy Space and Space Studios in Midland, Michigan, we'll be offering a workshop and exhibition based on this theme with community participants. We‘ll be casting our faces and hands to create a group ceramic sculpture, which will include “prayer ties” (in whatever way participants conceive of them) that serve as personal affirmations of our connection and committment to the Web of Life, and to the future. After being exhibited in August at the Midland Arts Center, participants will be able to take their sculptures home. Costs will include materials only. I was hiking in the Superstitions, looking for petroglyphs I’d heard were to be found in the back country, in the folds and recesses of the mountain. 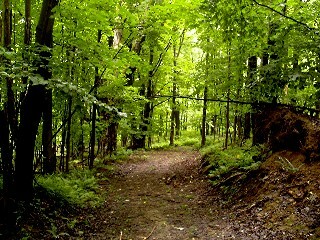 It was a strenuous climb for me, and they weren’t easy to find, obscured by the terrain, and often well off the trail. It took a while to decide where to look. The particular site I was seeking had been a special place to prehistoric Anasazi people, who had left layers of pictographs scattered throughout the entire area. I was thinking, as I searched for the traces and touchstones of these people, about what I knew of native mythology, and wondering what these artists from so long ago might have been communicating with their mysterious imagery. There was so much I wanted to learn about the traditions, histories, and stories of native Americans in the Southwest - among them the Hopi and the Pueblo peoples. And of course the Navajo, whose rugs and pottery fascinated me. In Arizona, where I live, a great deal of art, aesthetics, and architecture is inspired by indigenous cultures, but very few people actually take the time to learn very much about these diverse and ancient peoples. I was among them. I was thinking about the mysterious figure of Spider Woman, also called “Thought Woman” by the Hopi. Spiderwoman is poised at the very center of the Web of life in many native American creation stories. 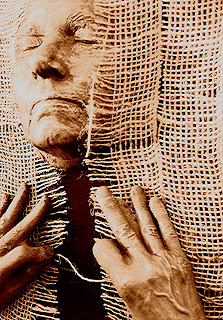 Arriving from underground realms, she creates the world, and then passes the creative process on, forever offering her wisdom, and the sacred craft of weaving, to her grandchildren. I’m not entirely sure I like to call Spiderwoman (who over the years has become my guide and muse and inspiration) a “metaphor”, or an “archetype”. Although I was thinking along those lines while I huffed up the mountain. 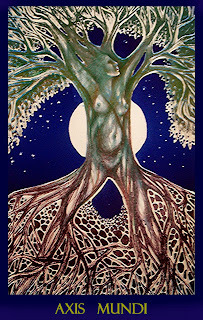 The most profound meaning of Spiderwoman’s Web is as the universal symbol of planetary and spiritual ecology. Spiderwoman speaks in the wind, reminds us of who we are beneath the surface with her synchronicities and threads. The web that Thought Woman sings or names into existence represents, to me , what quantum physicists call “Entanglement Theory” - the probability that everything, down to the most intangible dancing particles and waves - is “entangled“, is woven together, is one. All conscious in some fundamental essence, within a universe of unimaginable creativity. And as she named them, they appeared. What’s a word, if not a thought that has been crystallized? Spiderwoman was “on my mind“ as I walked. Or, perhaps, Spider Woman judged me ripe enough to turn her attention my way. The famous lost Dutchman took his secret gold to his grave, but the Superstitions hide other kinds of secrets. Eventually, out of breath and already sunburned, I found what I was looking for. Near a welcome and rare spring, with layers of petroglyphs on adjacent rocks. Combined with natural beauty and a sense of potent geomantic energy, it was a place that seemed infused with numinous power. And scattered throughout like a motif or underlying texture there were hands, painted or incised on the rocks. Hands among hunters and big horned mountain sheep, near metate holes that once ground blue corn or mesquite, protecting solarized shamans in their ecstasy, touched odd shapes and circles, or seemed to hold snakes and spirals that wound and curled like water or wind from fingertips. 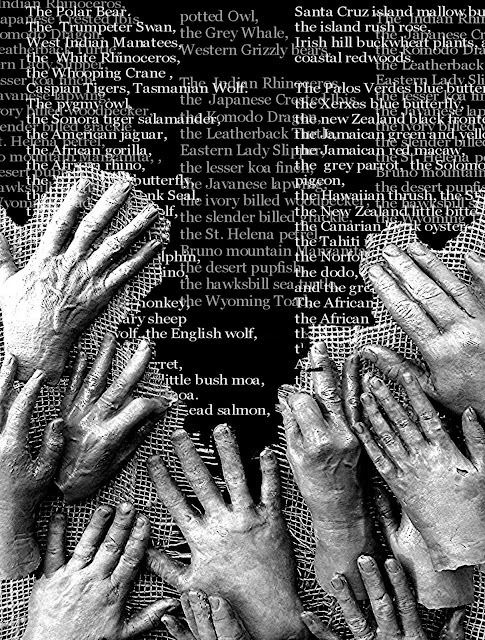 Shadow hands scratched into the rocks, weaving the stories as they were being told. 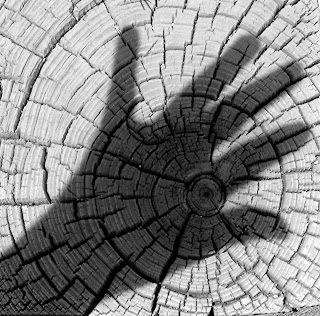 There was a presence in those ubiquitous hands that absorbed my imagination. As if, for that quiet, illuminated moment, I saw them become fully fleshed, emerging from beneath the transparent, dreaming surface of the canyon. Numinous. 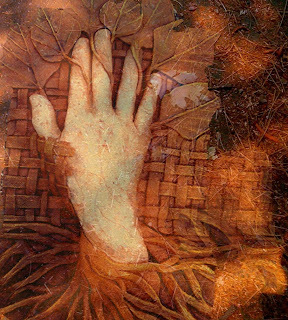 It occurred to me I was looking at Spider Woman’s many hands, appearing on the canvas of another time. From the wise storytellers of the desert, to the great webs of planetary ecology, quantum physics, and even the internet - Grandmother Spiderwoman was reaching out to teach her grandchildren how to weave . The origin of the word “religion” comes from a word that meant “to link back“ (religios), which bears (again) the metaphor of weaving. In Eastern traditions, each verse of a tantra (meaning a spiritual practice) is called a sutra, which means “a thread”. So perhaps the real meaning of a religious experience concerns “linking back”, re-membering a greater tapestry of being beyond the narrow viewpoint of individualism. At that thought, being an artist and mythologist, I had to pull out my sketchbook and attempt to turn my revelation into something I could take back with me, something I might be able to share. An icon that could be enshrined as a symbol of planetary ecology. I imagined a shrine that would frame an elegant Web of concentric circles of relationship and co-creation. 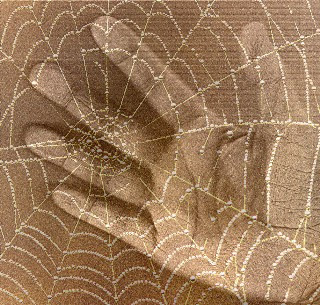 It occurred to me then that a spider web represented the quintessential symbol of interconnectedness - but perhaps a loom was an even better iconic image for Spider Woman/Thought Woman. A loom: an engine of interwoven and interdependent fibers, coming together in continually creative patterns of relationship. A loom meant the active art of weaving. The pattern was always changing. There was a vertical and a horizontal, a warp and weft, light and dark, yin and yang - the dynamic exchange of polarities to create something new. 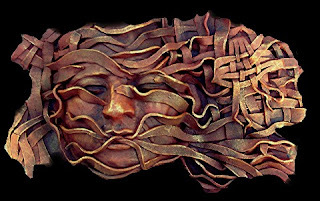 The weaver’s thoughts and hands manifesting, undoing, creating, unraveling. My imagination took off. Navajo story tellers say that Spiderwoman is best heard in the lonely wind, and that with practice, you can hear her whispering in your ear. As I drew a lovely spider web, and then a complex woven pattern …………..something like that happened. It sounded like a kind-hearted chuckle. So I went a step farther with my logic. Even the Web (or Loom) of Life is still a pretty abstract idea. I think our task, as artists and mythmakers, may be to move increasingly away from abstractions, because abstractions move us increasingly away from being truly within the world. We need to find practical ways to experientially know that we are embedded and embodied within the immanent sanctity of our Earth. Myths that speak, in our hour of evolutionary crisis, not about how to manage, use, abstract or renounce the world - but how to join it. Hands. Spiderwoman’s hands. Collaboratively weaving. My hands. Your hands. Our hands. And that’s what I drew in my sketchbook, and then I had to leave, because I was afraid I might not make it back to the trailhead before it got dark. But I realized something important as I managed my way down the trail and into a magnificent Arizona sunset. I had been given a Blessing. And blessings, like all things that have to do with Spiderwoman, are circular. You don't get to keep them. Sooner or later, you have to pass them on. 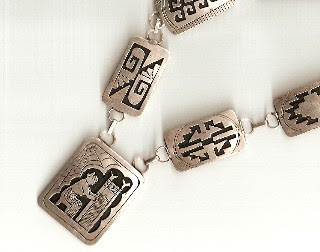 1 The Navajo also symbolize her with a cross, representing wholeness within the 4 directions. for us to hatch our children. Re: "Speaking to the Earth" -- I found a wonderful story from Alice Walker and I take the liberty of excerpting it here, and hope I won't be punished for publishing without permission. But it's so worth sharing. A few years ago I wrote an essay called "Everything is a Human Being", which explores to some extent the Naive American view that all of creation is of one substance and therefore deserving of the same respect. In it I described the death of a snake that I caused, and wrote of my remorse. That summer, "my" land in the country crawled with snakes. There was always the large resident snake, whom my mother named "Susie", crawling about in the area that marks the entrance to my studio. But there were also lots of others wherever we looked. A black-and-white king snake appeared underneath the shower stall in the garden. A striped red-and-black one, very pretty, appeared near the pond. It now revealed the little hole in the ground in which it lived by lying half in and half out of it as it basked in the sun. Garden snakes crawled up and down the roads and paths. One day leaving my house with a box of books in his arms, my companion literally tripped over one of these. We spoke to all of these snakes in friendly voices. They went their way, we went ours. After about a two week bloom of snakes, we seemed to have our usual number: just Susie and a couple of her children. A few years later, I wrote an essay about a horse called Blue. It was about how humans treat horses and other animals; how hard it is for us to see them as the suffering, fully conscious, enslaved beings they are. After reading this essay in public only once, this is what happened. A white horse came and settled herself on the land. (Her owner, a neighbor, soon came to move her.) The two horses on the ranch across the road began to run up to their fence whenever I passed, leaning over it and making what sounded like joyful noises. They had never done this before (I checked with the human beings I lived with to be sure of this), and after a few more times of greeting me as if I'd done something especially nice for them, they stopped. Now, when I pass they look at me with the same reserve they did before. But there is still a spark of recognition. I think I am telling you that the animals of the planet are in desperate peril, and that they are fully aware of this. No less than human beings are doing in all parts of the world, they also are seeking sanctuary. But I am also telling you that we are connected to them at least as intimately as we are connected to trees. Without plant life human beings could not breathe. They are the lungs of our planet. Plants produce oxygen. Without free animal life I believe we will lose increasingly the spiritual equivalent of oxygen. "Magic", intuition, sheer astonishment at the forms the Universe devises in which to express life - to express itself - will no longer be able to breathe in us. But what I'm also sharing with you is this thought: The Universe responds. What you ask of it, it gives. The military-industrial complex and its leaders and scientists have shown more faith in this reality than have those of us who do not believe in war and who want peace. They have asked the Earth for all its deadlier substances. They have been confident in their faith in hatred and war. The universe, ever responsive, the Earth, ever giving, has opened itself fully to their desires. Ironically, Black Elk (the Lakota shaman) and nuclear scientists can be viewed in much the same way: as men who prayed to the Universe for what they believed they needed and who received from it a sign reflective of their own hearts. I remember when I used to dismiss the bumper sticker "Pray for Peace". I realize now that I did not understand it, since I also did not understand prayer; which I know now to be the active affirmation in the physical world of our inseparableness from the divine; and everything, especially the physical world, is divine. "Whatsoever you do to the least of these, you do also unto me” - and to yourself. For we are one. "God" answers prayers. which is another way of saying, "the Universe responds". We are indeed the world. Only if we have reason to fear what is in our own hearts need we fear for the planet. Teach yourself peace. Pass it on." Think of someone you parted from. Parted from not well. In anger or disappointment. Think of your last mental photograph of that person. Now imagine one of the best days you ever spent together. Pull it up, upload it, change the page, and there it is, a snapshot in your memory album. Find another one - one of those best days. Re-weave the story. It’s one of those days, ambrosia, green, the green breath of the trees, the green pulse of the river flowing by me as I ride my bicycle, green, potent, living, the green heart of the Earth beating its rhythm of Summer. Spiderwoman threw me a random thread that pierced my heart in the midst of all this Beauty, as I rode my bike by the river. And suddenly a whole passage of my life streamed open before me, a thread, a ribbon, a summer that passed..........a story, and a little bit about places and times that “speak to the earth”. Ok, bagpipes may not do it for everyone. But the sound of bagpipes well played, ebbing and keening and calling from somewhere in the trees, can bring forth the flavor, the essence, the sounds of another time, and another mind. Not just Scotland (although Scotland and its history is fascinating enough), but a time much farther back, a “pagan” time of standing stones that marked the starry heavens and solstices with amazing accuracy, and power places, “Temanos” places, where people went, following the circular logic of nature, to petition the gods, to participate in the great fertility, to bury their dead to be reborn in the great tomb that was also a womb, to seek vision - to, in effect, speak to the Earth. Is it not possible to think of the artifacts of the ancients, which we so love without understanding at all, as such? Who whistles and whirls her hounds and ravens………. Twenty years ago I spent my gypsy summers at the Renaissance Faire in New York, and I was in love with Kerry McNeil, who came from Glencoe, Scotland, and played the bagpipes with such feeling you had to dance, or follow him like the Pied Piper, wondering where he would lead you, or sometimes, you had to cry. Kerry was a true master of his art. By master, I mean his instrument had become a part of his body, his voice, his larynx, it vibrated and beat and sang and sourced right out of his heart. In some ways, it was his true voice, because in other ways Kerry was unable to speak. Things he couldn't say to me, to himself, to the world he felt like an anachronism in..........all these things and more were eloquent and came to vivid life when he played the pipes. Bagpipes were used, of course, to herald soldiers marching to battle, to scare the hell out of their opponents no doubt. Their keening wail can be the voice of pure lamentation as well, wailing and calling for lost comrades. Or exhaultant celebrations, an exuberant dance of weddings and the springtime of life. But what many do not know is that bagpipes, with their unique deep vibration, are a very ancient instrument that predates the Church in Great Britain, an instrument that predates the invasions of the Danes, Saxons, Romans, and probably even the Celts. Capable of striking a resonance with the heart, they have been used to open the "heart chakra", and hence, to clear, sanctify, and invoke in ritual or prayer. Like Tibetan bowls, or chanting the Ohm, bagpipes can change consciousness. Just as drumming together is a means to weave synergy, the roots of the bagpipe are ceremonial, meant to create resonance between tribal members at the level of the heart. At any rate, a long time ago people came there, laid the stones, and prayed. We “Rennies” came there as well, and called the place “Spirit Mountain” because of its heightened energies, mystery, and the stories of strange experiences people had there. I myself spent a night on “Spirit Mountain”, and remember waking in the night to see the rocks glowing purple, and light illuminating some of the stones. Judith, who camped with me, went to pray to find a mate. Come to think of it, she did get married about a year later. I remember being with a group that summer who were making a blessing for the Faire on opening day. Kerry walked around and around us with his pipe, making a kind of vibrational “container” for us to generate energy. I also remember several times, that summer, distinctly hearing the sound of bagpipes in places where they could not possibly be. I began to think, not without justification, it was Kerry’s way of greeting me. I think I'll always see Kerry standing there in his kilt - always a lonely figure, at the end of the day, talking to the trees and reverently bidding the sun goodnight with his music - whenever I hear bagpipes. I found a poem I wrote for him, after, almost, the last time I saw him. I never showed it to him. But it’s not a bad poem, and I feel like copying it here. A thread, a bright summer, a heart opening to the beauty of it all, and I thank Kerry for the memory, wherever he may be. and live in eternity's sunrise"
1 Misc. quotes from “5 Denials on Merlin’s Grave”, by Robin Williamson. Who, in fact, Kerry introduced me to, and I have treasured every word from the Bard’s mouth ever since. 2 for information, I recommend looking up “America’s Stonehenge”. Or America B.C. by Barry Fell, or Manitou, by Mavor and Dix. Also, the New England Archeological Research Association (NEARA). Also, anything by Sig Lonegren, formerly of Goddard College, on the geomantic sites of New England. For that matter, I recommend many books from the 1980’s that addressed earth energies, geomancy, Gaianism, and “spirit of place”. Their message is more important than ever, and it is disturbing to me that such books are not to be seen much anymore. Among them: EARTHMIND by Deveraux, Steele, and Kubrin. 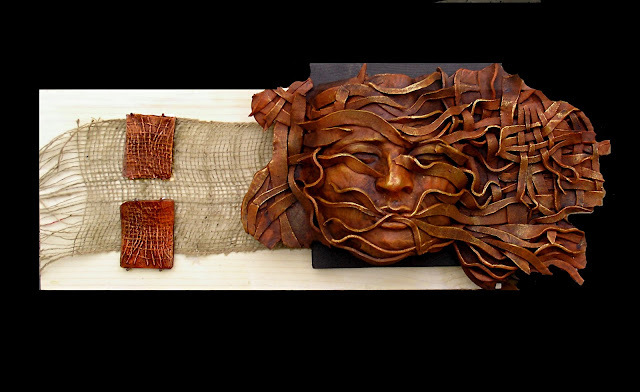 EARTH MEMORY, by Paul Deveraux. SACRED PLACES, by James Swan, and DIALOGUES WITH THE LIVING EARTH by James and Roberta Swan.